Excellent protection from nasty weather. 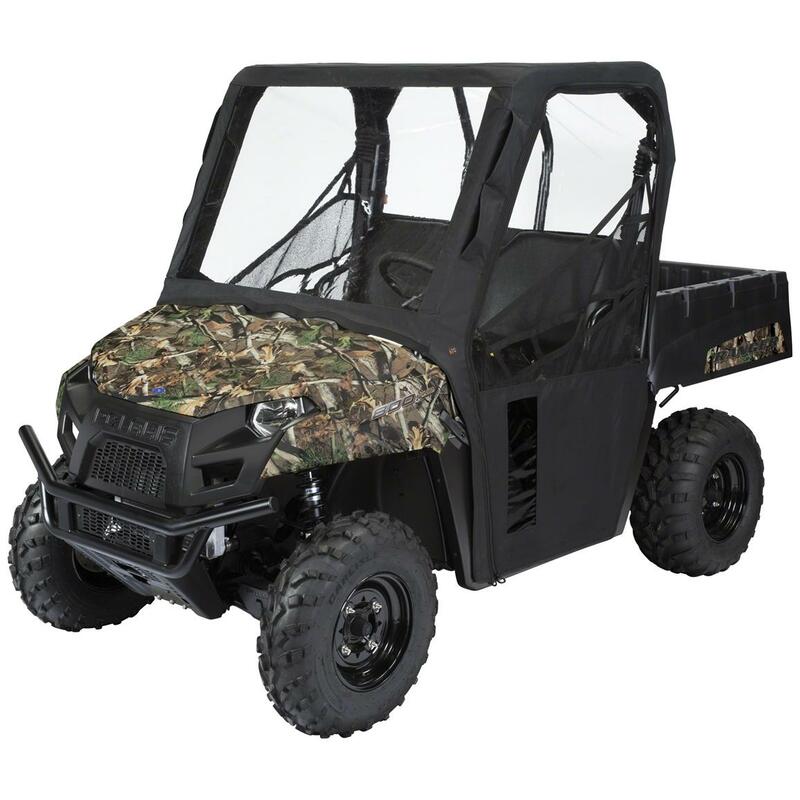 The Quad Gear UTV Cab Enclosure mounts directly and securely to your UTV's roll cage. Click-close straps and grip-strip tabs make sure it doesn't come off or slide down, leaving unsightly gaps. 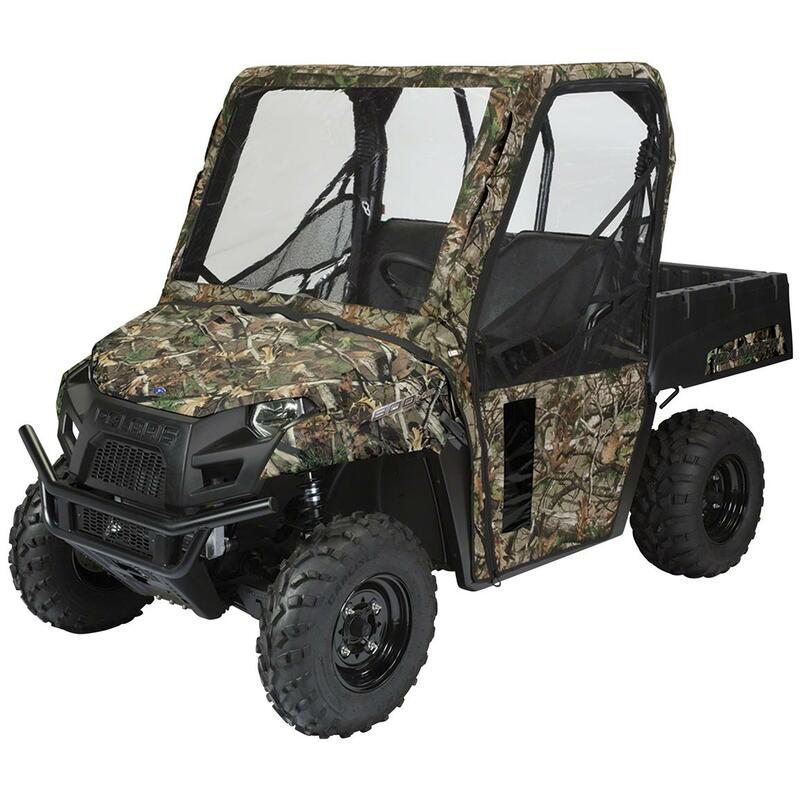 To further enclose your UTV, additional adhesive-backed grip-strips are included. The doors can be completely rolled back or removed for easy cab access and ventilation. An enhanced venting system was built into the Enclosure for added circulation. This Enclosure keeps your cab clean and dry, even in storage. It's all in the fabric! An enclosure is only as good as the material it's made of. This Enclosure is constructed of heavy-duty ProtekX6TM fabric. The ProteckX6TM has water-resistant backing and exterior coating for maximum weather and abrasion resistance. The large ultra-clear windshield material, doors and back window give you outstanding clarity, while keeping you protected from tree branches, mud and other flying debris. Keeping you, and your cab, clean and dry! Don't let Mother Nature stop your day on the trails! From rain to hail, Mother Nature throws more than enough things at you to keep you inside. Be defiant!! The Quad Gear Cab Enclosure keeps Mother Nature at arm's length. With a strong weather-resistant coating and water-resistant backing, this Enclosure was designed to fight with nature and come out victorious. No long will rain and hail keep you inside. State color and order today! Quad Gear UTV Cab Enclosure, Polaris Ranger 2002-2008 Series is rated 3.6 out of 5 by 7. Rated 1 out of 5 by ronl from bad fit for older polaris ramgers would not buy again. lightweight material and does not fit well around roll cage, should have made at least 1 inch larger all around. struggle to get on even when warm. paid $100 more to another supplier for a much heavier one that lasted over 10 years doubt this one will make 2. Rated 4 out of 5 by RLS1257 from Good fit and great value. Was a gift and really like the benefits of a covered cab. Priced very good and quality seems to be good. Nice product. Rated 4 out of 5 by pasenior from Fits like a glove I purchased utv cab enclosure about a month ago and at first the doors would not zip , I put it in my heated basement and it seemed to fit after it was warmed up, then left it sit in the sun one afternoon and the doors now zip easily. Make sure it is warm when you install it. I have 2012 Polaris Ranger 500 (mid size) they told me it would not fit , but it is same size as Ranger 400 only difference is engine. Rated 5 out of 5 by chuck66 from GREAT CAB ENCLOSURE I BOUGHT THIS A YEAR AGO AND HAS BEEN A GREAT ASSET . FEEL SAFER ESPEICALLY WITH GRANDKIDS AND PETS. Rated 5 out of 5 by Dellharley from Best price I found Fits pretty good, a little difficult to slide vinyl on the tubing. Comes packed with cloth like sheet in top, may use this to install top then remove. Windshield is wavy from being packed, may smooth out with time. Make sure to use alcohol to clean surfaces before applying self stick Velcro. Measures 63.75"l. x 35"w. x 42.5"h.
Mother Nature keeps you indoors enough…it's time to fight back! Hit the trail in comfort. An easy, affordable way to make your ride more comfortable! An easy, affordable way to make your ride more comfortable.